The whole world is going gaga over Social Media these days, and the rationale for that is the augmented awareness about its potential. Individuals have begun to perceive it as a tool (in contrast to their earlier view, that social media was a great way to rid off boredom), to help develop their careers, also as a great way to reach out to larger groups of people, either enabling them to garner more support for their cause or plainly put, grab more eyeballs. Businesses world over have reacted in a somewhat similar way, they have finally woken up to find themselves in a new era of digital marketing. Now, they’re going wild with their strategies to unearth the hidden treasures from the coffers of this new prodigy, which has grown in mammoth proportions over the last few years. I’m sure individuals would’ve gained from this, but how has enterprises fared using this medium? While launching their Z-series workstations, HP’s social media strategy was to identify the biggest influencers within agencies who were heavily interactive and participative in online technology and hardware conversations. They created a character, the superhero Mr. Z, to anchor this campaign. HP loaned the 12 selected influencers a Z-series workstation and got them to use and talk about their experience of using the product in creative ways. These 12 individuals were asked to make short animation clips which were posted to YouTube. Blogs on the z-series experiment were created both on the agency websites and independent blogs. The winners had their clips on the Mr. Z website and HP continued the conversations on this product via Facebook and Twitter. AMEX’s strategy was to drive their pull marketing by “having something differentiated to say, get influencers to speak about it, and use social media to allow it to scale”. AMEX embarked on this campaign after their research identified that the use of social media was increasing amongst the older and more mature small business owners in the running and promoting of their businesses. The site “Open Forum” is divided in two sections; the idea hub and the connectodex. The idea hub is a space for business owners to blog about the topics they are passionate about without first investing the time and resources to develop their own corporate blog. These posts and the resultant conversations in the community gave AMEX a firsthand sneak peek into what their consumers were looking for. It also provided AMEX an opportunity to drive conversions to their other products and services, from their participation and conversations with the consumers via the forum. Just having a space to blog would not necessarily drive traffic to that site and that’s where the second part of the forum comes in. The connectodex is a community of business owners who have been approved for an AMEX business card. AMEX validates these businesses through their open endorsement of them as credit worthy organizations and gives businesses a forum and community within which to connect to one another to grow their business networks and opportunities. It is needless to say that B2C companies have it much more easier for them (while reading further you’ll realize that I’m referring to the effort put in Vs business generated ratio), when it comes to leveraging their business using the social media. Instead of giving you some more case studies, let me throw some statistics at you. 46% of Facebook users have said that they would talk about or recommend a product on Facebook. 44% of Twitter users have recommended a product. Over 40% of people have “friended” a brand on Facebook or MySpace. 20% of tweets are about products such as invitations for product information, answers or responses from peers, or directly communication by brand representatives. Pepsi dropped TV advertising for the 2010 Super Bowl after 23 years. Instead, they invested in a $20 million social media campaign in 2010. Best Buy has over 2,500 employees helping customers via Twitter as part of their Twelpforce initiative. Dell has attributed over $6.5 million in revenue directly to Twitter. Social media played a major role in 2009 holiday shopping — 28% of U.S. shoppers say social media has influenced their purchases. 99% of online retailers plan to have a Facebook Page by 2011 and 91% plan to have a Twitter page. Social media usage is taking hold at both B2B and B2C business — 81% of B2B and 57% of B2C businesses maintain company-related profiles on social networks. 75% of B2B Marketers participate in micro-blogging compared to 49% for B2C Marketers. Research shows significant growth in the use of social marketing among B2B marketers, with 70% now using social media channels, up from just 15% in 2007. 93% of business buyers believe all companies should have a presence in social media. 85% of business buyers believe companies should not just present information via social media, but use it to interact and become more engaged with them. 9 out of 10 buyers say that when they’re ready to buy, they’ll find you. Over 70% of purchases are restricted to established vendors or are heavily dependent on Word of Mouth recommendations. More than 8 out of 10 IT decision-makers said word of mouth recommendations are the most important source when making buying decision. 93% of B2B buyers use search to begin the buying process. 63% CXOs first turn to mainstream search engines to locate information. Executives in IT are the most prevalent users of the Internet for information gathering. 53% of C-level executives said they prefer to locate information themselves. 89% of journalists make use of blogs while conducting their online research and 96% turn to corporate websites. Social media spending is expected to increase from $716 million in 2008 to $3.1 billion in 2014, a 34% compound annual growth rate (CAGR). 13% of the Fortune 100 has at least two active Twitter accounts. 53% of the Fortune 500 has at least one active Twitter account. 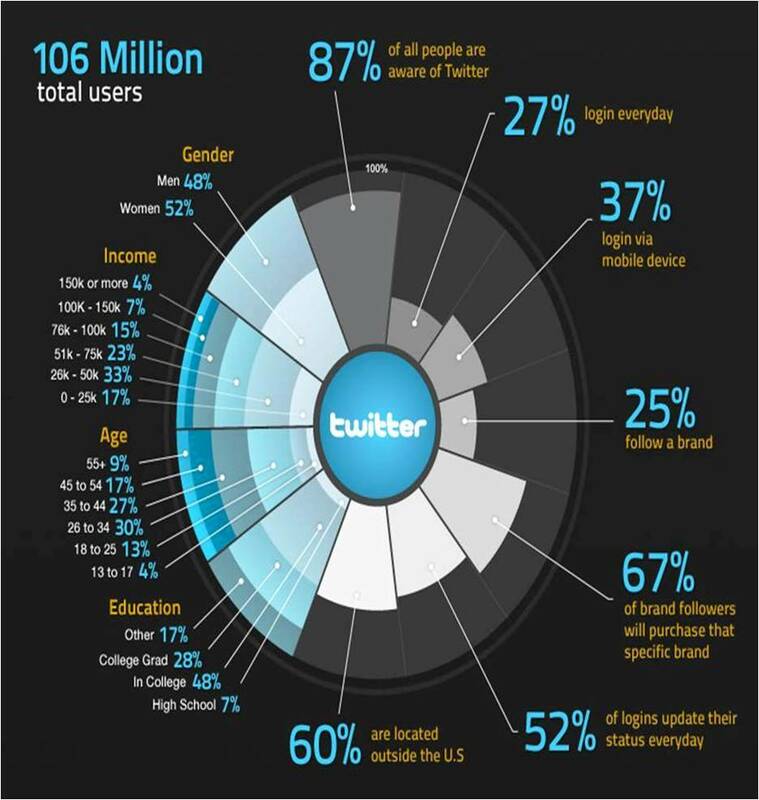 57% of the Fortune 100 has at least one active Twitter account. 81% of CMOs plan to link up to 10% of their company’s revenues to social media investment this year, up from just 44% in 2009. Hope this piece has helped in giving you an insight about the trends of social media marketing spends in the B2B and B2C space. I would love to hear from you on how concentrated your organization has been on the social media marketing platform. I would also like to know your ideas/suggestions on how we can implement effective social media strategies in the B2B space. We are also in the B2B business and I like this post very much. Good work.